Offering incredible agility and versatility, Mack's ear protection products give you the choices other moldable silicone plugs just don't provide. From super-soft foam ear plugs to safe ear drying drops, Mack's offers protection from not only noise, but also from water and in-flight air pressure. Mack's soft foam and moldable silicone putty ear plugs are also available in the neutral colors most requested by our customers! (NRR 32) Mack's Shooters Ultra Foam Ear Plugs are very soft average sized foam ear plugs for shooting. These tan colored foam earplugs provide great protection, whether you're at the range or in the field. Comfortable enough for all day or all night protection. 3 pairs. 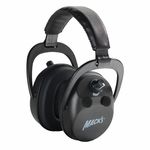 (NRR 26) Mack's Ear Seals reusable shooting ear plugs are made of extra-soft, pre-molded silicone rubber flanges and a stiffer central core for extraordinary sealing against loud noises as well as water. The stiff core makes insertion easy for adults and kids alike. Sleep like a movie star anywhere! When you want to shut out the world so you can sleep, ear plugs can block the sound, and this premium sleep mask can block the sights.